Spam has become an annoyance to anyone who uses email. Whether it’s Google mail, Hotmail or any of the many other email service providers that is being used, most service providers try to help their users keep spam out of their inboxes. Here is how Google mail keeps unsolicited emails at bay. Google mail (a.k.a. 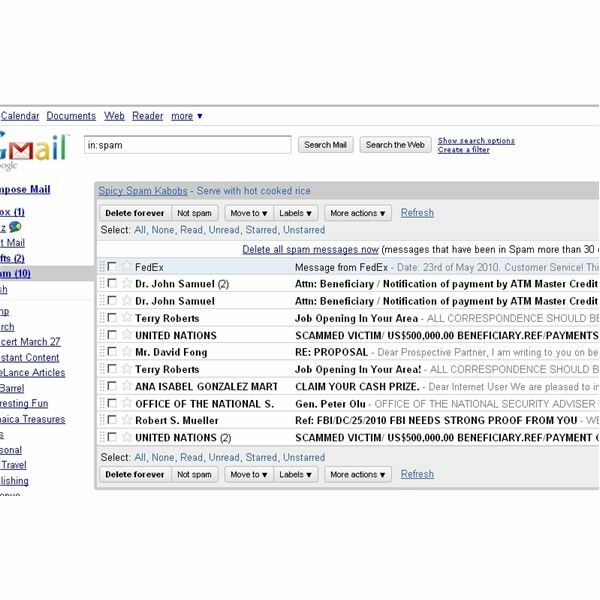 Gmail) is Google’s free email service that is available to users across the globe. By default, Google has features that automatically block spam without user intervention. This is a backend service that Google provides to its Gmail account holders by keeping a list of known spammers and automatically putting them in aptly named spam folder. While this feature does help users filter a large number of spam emails, the user does have some other options to manually or automatically filter emails themselves. This is perhaps the easiest of all Gmail’s spam control measures. Junk emails that slip through can be flagged for deletion by clicking the report as spam button in the email window. Doing this helps Google to identify new spammers, as well as flagging the odd junk mail that slips through. Here is how to remove spam from your inbox. Select the offending or junk email. How to permanently delete spam. Click the Spam folder; it is located to the left side of any Gmail page. Click ‘more,’ (just above Contacts) if it is not listed. The message could not be verified as coming from right sender. The ‘To:’ and the ‘From:’ fields contain the same address. In the top-right corner of the message window, click show details. Look in the ‘mailed-by’ field. If the field is blank, the message is not authenticated. Whether users give out their email addresses or not, spammers seem to have a never-ending number of ways to discover and exploit those addresses. Fortunately, email service providers try to help users keep spam at bay with blocking services, such as that found in Google mail spam settings. Users also have a part to play in making the process more efficient and effective, by reporting spam messages that fall through to the cracks, and end up in their inbox. In a similar manner, when legitimate messages end up in the spam folder users can simply click the ‘not spam’ button to put the message on their white list.